I was doing a quick audit of my chess book collection, and I came across a couple of interesting things. Firstly, I seem to own 8 copies of Play Better Chess by Leonard Barden, and secondly, I really need to read more of the books I have. Without it being planned this way, the next week (and the last few days) has been a kind of unofficial chess festival in Canberra. Last week saw the ACT Junior Chess League's Interschools Championships get underway, with the Primary Girls North and South Zones being held (Congratulations to Caroline Chisholm, and Tuner for winning their zones). On Saturday the ACTCA then had a stand at the Connect and Participate Expo, while Sunday saw 77 junior players take part in the Autumn Allegro event (won by Thomas Johnston). On Tuesday there will be a chess event in the Canberra City, in Garema Place, from 11 to 2pm. The big pieces will be in action at the giant chess board, while you can drop in for some casual (and not so casual games). WIM Heather Richards and FA Alana Chibnall are organising this event, which will bring chess to the city. Wednesday night sees the Pre-Doeberl blitz at the ANU Chess Club. This is a free event which starts at 7pm, at the Asian Studies Building at the ANU. Then on Thursday the O2C Doeberl Cup itself begins at University House. Round 1 of the Premier starts at 1pm, with the second round starting at 7pm. No charge for spectators, so even if you are not playing, come and down and see the Grandmasters in action. Today's Street Chess saw a number of interesting games, some of which highlighted how cruel chess can be. In the diagrammed game, White is two pawns up and under normal circumstances this would be a straightforward win. But the poor position of the White rook allowed Black to force a draw, by using the threat of mate to drive the White king into a position where it could not escape the checking rook. 1.Kf1 Kf3 2.Ke1 Ke3 3.Kd1 Kd3 4.Kc1 Kc3 5.Kb1 Rh2! was the first part of the dance. In the actual game White then moved the rook, allowing the draw after Black checks on h1 and h2. But even after 6.a4 Black still draws with 6. ... Rh1+ 7.Ka2 Rh2+ 8.Ka3 Rh1! where the theme is repeated, just this time while turned 90 degrees. 9.Ka2 is forced when 9. ... Rh2+ leads to a repetition. During the week I helped run a couple of local interschool events in Canberra. As with a lot of these events the quality of play can vary, but on the upside, you get to see a lot of positions that probably have not occurred in 500 years of organised chess. In one game I saw a Black King on a1, being checkmated by a white queen on h8, despite the board still having a reasonable amount of material on it. Wondering how common this might be, I did some searching of my database, but came up empty handed. Even with colours reversed (WK on h8) I found nothing, so I thought I would simplify my search. Looking for White kings mated on h8 I came up with a few examples, mainly between lower rated players. But I did find one gem, from early in Gary Kasparov's career. It looks as though it was played in a simul, but in this case Kasparov was not giving the simul. He was playing Oleg Romanishin, and after around move 20 he was already winning. With his king exposed, Romanishin tried to use it as a fighting piece, but instead it was dragged up the board to h8, where it was mated in good junior fashion, with an 'electric fence' checkmate. I had an interesting experience during my game at the local club last night. Having played the first 9 moves of Marshall Gambit theory I was surprised by my opponents 10th move. 10.d4 seemed slightly odd, but at first I could not decide whether it was good, bad or just different. After taking the pawn I was then surprised by my opponents 12th move, when he took of d5 rather than d5. For a brief moment I thought I had been tricked, as the bishop on e7 hangs after Qxd5. But then I thought to myself "If this is a trap I would have heard of it before". The Marshall is a well established opening, and I have been playing it for 30 years, so a surprise like this would have come to my attention long ago. Armed with this knowledge it did not take me long to realise that Qxd5 was more than fine, as Bb7 threatening mate on g2 holds everything together. It even turned out the the whole idea was worse for White than I or my opponent realised. After White played 14.f3 I decided to try and trap the rook with 14. ... Ne6 and eventually I won the exchange. But 14. ... Qc5 is even stronger hitting the rook on e7 and threatening all sorts of discovered attacks. So there is a trick in this variation, but it is a trick for Black, not for White. Eighteen year old Fred Litchfield is the 2015 ANU Masters Champion, after a final win over Harry Press. The last round saw 4 players still with a chance to win the tournament, but the win by Litchfield, and a loss by Victor Bragine saw Litcfield win the tournament by a full point. Tied for second were Braguine, Miles Patterson, and Alana Chibnall, on 4 points. Braguine, who lead the tournament for the first 6 rounds, was beaten by top seed Andrey Bliznyuk, who finished the tournament on 50%. Patterson looked like he was winning against Adrian De Noskowski, but a perpetual check saved De Noskowski, who finished the tournament with 5 draws from 7 games. Chibnall reached +1 with by beating Jeremy Reading, who ended up tied for 6th place with Press and De Noskowski. In the supporting Challengers event, Brian Butler defeated Michael Reading to finish on 5./7, qualifying for next years Masters. If you haven't entered this years O2C Doeberl Cup, and are still planning to, you better enter as quickly as possible. The last week has seen a big rush of entries, and as a result a number of events are near capacity. Surprisingly it is the Major (Under 2000) that has filled up first, with only 1 place left (and that was after the the limit was increased!). The Premier still has 15 spots open (although 80 is the hard limit for this one), while the Minor (Under 1600) has 13 spots open. The Under 1200 still has plenty of room, but with only a maximum 50 players in this event, entering sooner rather than later is the smart thing to do. At last count there were 209 entrants across the 4 events, around 50 short of the maximum the venue can hold. With the new venue (University House, ANU) we hope to avoid the crowd issues of the last few years. There is plenty of space outside the venues, and there is a large bistro and bar located downstairs. Even if you are not planning to play, it is a very good setup for spectators who simply wish to spend a day watching chess. An interesting story buzzing around the net for the last few days concerns mathematician John Urschel. He recently published a joint paper titled 'A Cascadian Multigrid Algorithm for Computing the Fiedler Vector of Graph Laplacians' The fact that he published such a paper is not that suprising really, as he does hold a masters in Mathematics. Slightly more interesting is that he is also a chess player. According to one bio I saw he played in the Under 1700 section of the 2015 Pittsburg Open, scoring 3/5. Of course that does not make him that special, but neither maths or chess is his current day job. The real reason why his paper has attracted so much attention is that when he isn't writing papers or studying chess, he is an offensive linesman for the Baltimore Ravens NFL Team. An odd mix of career (although not completely unknown) but one he is comfortable with for know. More background on both his paper, and his sporting career can be found here. The 2015 Dubbo Open ended with Harry Press and Dragan Granjis tying for first place with 5/6. Half a point behind were David Lovejoy and NSW Country Champion Fritz Vander Waal. The second day started with David Lovejoy half a point in front, and he kept his lead with a draw against Alana Chibnall. He was joined by Harry Press, who beat Oskar Hellmann, and they played in the 5th round. After a lot of manoeuvring in the Ruy Lopez, Press found a breakthrough on the kingside and went into the last round with a half point lead. Close behind Press were Dragan Granjis, who had beaten Chibnall in round 5, and Vander Waal, who had beaten Malachi Odonoghue. In the final round Press drew with Vander Waal to guarantee at least a share of first place, where he was joined by Granjas, who beat top seed Don Keast. In third place were Vander Waal, and David Lovejoy, who beat tournament organiser Alexander Aich, to reach 4.5. Rating prizes were shared by Aich, Col Parsons, Hellmann and Bill Egan (Under 1700), while John Sumner won the Under 1300 prize. Nikhil Rajesh was the best junior player. While the field was a little smaller this year it was still an enjoyable event for all who took part. The make up of the field meant that all the games were hard fought, and there were no easy draws. Press and Granjas went through the tournament undefeated, as did Fritz Vander Waal. Full standings from the tournament can be found here. The first day of the 2015 Dubbo Open saw the day end with a number of players still in contention for the title. The top end of the 25 player field were seeded reasonably close together so it was no surprise that each round saw a number of close games. Upsets started as early as round 1 when top seed Don Keast was held to a draw by former winner Bill Egan. Jonathon Harding also had a good start, beating Pertti Sirkka in a rook versus pawns ending. Given the makeup of the field, it was no surprise that the third round of the day saw a number of hard fought draws. In fact 5 of the top seven games ended in draws, all hard fought. As a result David Lovejoy was the only player to finish with 3/3, although there are four players half a point behind. Results from the event can be found at tournaments.streetchess.net and are updated after every round. Tomorrow sees David Lovejoy play Alana Chibnall on the top board, and the winner of this game will be well placed to win the tournament. In preparation for from trip to the Dubbo Open tomorrow, I decided to have a look at my past games from the tournament. From way back in 2003 I noticed I had played IM John-Paul Wallace and not remembering how the game went decided to have a look. The first moves looked ok although the choice of 2.Qd3 by Wallace seemed a little surprising. I wasn't sure whether this was an interesting opening experiment, or just a Carlsenesque attempt at livening up things. However once I played a few more moves it suddenly became clear. At some point in the past my son Harry, had been playing around with my chess database. This was when he was around 5 or 6 and well before he became a 1900+ chess player. It seems he inserted a number of random moves into the game, and then saved it to my database. There was at least one other game similarly affected, although I am yet to do a complete audit to determine the full extent of the damage. I'm pretty sure the result is recorded correctly (a win for J-P) but sadly it seems the correct record of the game has long been lost. So all I have left to show is a game that never took place, containing moves that don't make sense. I am a little bit reticent about showing this game. While it has some historical interest, in that Ian Hosking and myself have been playing against each other for 30 years, the quality of the play isn't that great. For the last few times we have played, I have used the Closed Sicilian, but for old times sake I went back to the Grand Prix Attack, which I used a lot 20 years ago. The only problem with it is that it no longer works as well as it did, as most Sicilian players have worked out what to do against it. And so it was in this game, where my bold pawn sacrifice just left me down a pawn. Then to compound matters I got my bishop trapped and all I had were some cheap tricks based on hitting the Black queen. However Ian miscalculated a combi starting with Nxg4 and I suddenly had some chances to salvage something from the wreckage. Nonetheless it still took some bad moves from both sides to end up in a drawn position. Along the way we both missed wins (29 .. Kg8, 31.Kf2) so a draw might have been a fair result, although 0-0 (the score, not the move) would have been more accurate. Round 6 of the 2015 ANU Masters could be described as one of missed opportunities. Each of the games saw assessments change dramatically with at least one ill judged moved, in some cases turning wins into losses, and then losses into wins. Fred Litchfield tried an ambitious exchange sacrifice against Adrian De Noskowski, but sensible defence seemed to give D Noskowski a clear advantage. De Noskowski even returned the exchange, but just as he reached an almost winning position, he allowed a perpetual check, which Litchfield immediately took. Harry Press inflicted Victor Braguine's second loss of the tournament in a game that could well have had a different result. Press won a piece after Braguine's queen ventured too far from home, but then had to fend off Braguine's remaining pieces. In attempting to simplify Press missed a trick from Braguine that should have turned the tables. 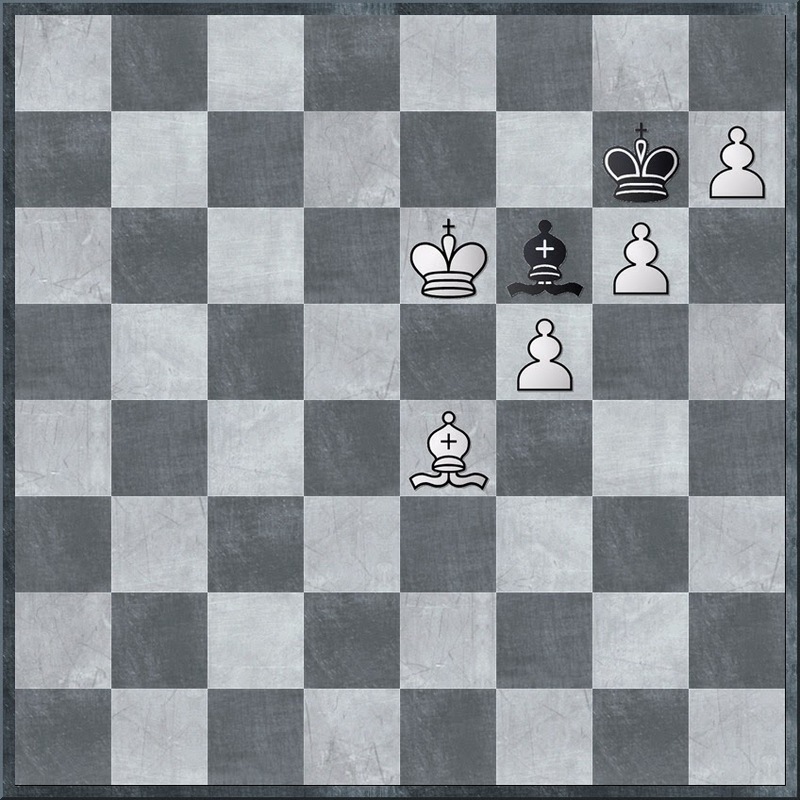 However Braguine missed the correct followup and Press was able to reach a winning rook and pawn ending. Alana Chibnall played the offbeat 2.Qe2 against Miles Patterson's French Defence, but ended up with a slightly worse position. However she was able to build a strong attack against Patterson's King and reached a double rook ending where she should have had a big advantage. But missing an obvious pawn recapture restored material equality and a draw was agreed a few moves later. Jeremy Reading defeated Andrey Bliznyuk in yet another game where the result was unclear for quite a while. After a complicated middlegame, the players reached a 2R v R+B+N ending. Advanced pawns helped Reading's rook control a lot of the board, so Bliznuk gave up a knight to eliminate as many pawns as possible. Once a RvB pawnless ending was reached a draw seemed likely, but Bliznyuk's king caught on the edge of the board Reading was eventually able to combine mate threats with attacks on the bishop to bring home the point. With 1 round to play Braguine and Litchfield lead on 4/6, followed by Patterson on 3.5 and Chibnall on 3. Depending on last round results, the winner could be anyone from this group, and a 4 way tie is even a possibility. There is so much good in this story of a home built chess robot. Apart from the chess bit, it uses an arduino to control the robot, and python scripting for software. Throw in a few under the board sensors and the ability to work with any UCI enabled chess program, and you soon see that the whole thing is full of win. It is the work of 17 year old Oriol Galceran, and he built it as part of a school project! Click on the above link for an overview of the project, and if you want to know more, click on the links in that article. It looks as though Sochi has replaced Khanty-Mansiysk as the "goto" venue for FIDE events. The FIDE Women's World Championships begins tonight in the city that played host to last years World Championship match. The event is a 64 player knockout, with the winner replacing Hou Yifan as World Champion, after she chose not to take part. However, as the winner of the last Women's Grand Prix, Hou is entitled to a match against the winner of this event, so she may only be relinquishing her crown briefly. Tonight is the opening ceremony, while play begins tomorrow. Humpy Koneru (IND) is the top seed (by rating), while Oceania is represented by IM Irina Berezina. If you wish to follow the games, you can do so at the tournament website. As part of a 2014 New Years resolution I abandoned the Grunfeld Defence and switched to the Dutch Defence as my main answer to 1.d4 While the experiment has not gone that badly, I am starting to run into a common problem, which is how to avoid drawish positions. I suspect some of my regular opponents have done a little research and have wheeled out some lines that are a little tough to crack. Usually the games have ended in draws, but while I don't mind splitting the point, in the main it is against lower rated opponents. But I shouldn't cry so much, as it could be worse. In the current Reykjavik Open, GM Alan Stig Rasmussen played the Dutch, only to be demolished in 19 moves. His opponent offered a pawn on move 9, and it only took a couple of missteps after that for his position to be in ruins. It is always worth having a bag of tactical tricks up your sleeve, as it can save a lot of time and effort when you need it to. An example of this occurred today at Street Chess. William Booth had the black pieces, and was trying to work out whether he was attacking, or defending against Dillon Hathiramani. In the end he tried to have it both ways, starting with an attacking move, but following it up with a defensive one. As a result he got into a muddle, ended up down a rook, but still collected the point when his opponent resigned just before running out of time. To the crowd of spectators watching the game this was all very exciting, but at least some of them spotted a far quicker win in the given position. For those that know the trick it is is pretty straightforward, but if you don't, it might be worth working it out and using it in the future. The 2015 Dubbo Open is fast approaching. This NSW Country event is always well organised and attracts a field ideal for the aspiring chess player who wants some good friendly competition without running the risk of being too outclassed. Over the years the winners list has contained players like GM Zong Yuan Zhao, IM George Xie or IM Gary Lane, but on the same list are players like Bill Egan, Alana Chibnall or Don Keast. But the reason most players play is not for prizes and glory, but instead for 6 competitive games over a pleasant weekend in a nice country town. The club also host a dinner of the Saturday night, followed by a 5 round handicap blitz event. It is a sad fact of life that most modern newspapers do not carry chess columns (at least in Australia). Those that do either syndicate their columns from another source, or squeeze it into the section left over after Sudoku's and Easy Crosswords are laid out. One notable exception (up until now) has been the Canberra Times Chess Column, written by GM Ian Rogers. This, and the Bridge column, have been allocated a reasonable amount of space, which allowed both coverage of international events, as well as local news and tournament results. Unfortunately the paper has decided to change the layout of these columns, and has reduced them both in size and importance. I fear that this is of course a precursor to eliminating the columns altogether. The long running Sydney Morning Herald chess column did not survive the death of Peter Parr, and the trend is to dispense with such 'niche' features altogether. In the case of the SMH, their stated reason was that not enough people complained about the columns absence, and so there was no need to keep it. Victor Braguine continues to lead the 2015 ANU Masters, bouncing back after his loss last week. against Jeremy Reading he waited until Reading overextended himself while looking for an attack that wasn't there. Eventually Reading had too many pieces under attack and was forced to surrender material. Fred Litchfield held on to second place, beating Alana Chibnall in an old fashioned Italian Opening. As in her first round game, Chibnall's position was not as bad as she thought, and she had drawing chances up until the last few moves. However she missed the best continuation and resigned when faced with a lost ending. New ACT Champion Adrian De Noskowski had a clear advantage for a lot of the game against Harry Press. But Press was able to whip up counterplay despite being a pawn down, and after the exchange of most of the pieces, a drawn position was reached. In the longest game of the night Miles Patterson and Andrey Bliznyuk drew after reaching a complicated ending. With a Queen and 3 minor pieces each both sides were looking for a winning breakthrough but eventually the point was split. With two rounds to play, Braguine leads with 4/5. Litchfield is second on 3.5 and Patterson third on 3. The Australian Broadcasting Commission (ABC) featured chess in an article the other day, looking at the link between good health and good chess. A number of Australian players were quoted, including GM Zong Yuan Zhao and FM Manuel Weeks. One player featured in the story was GM Gawain Jones, who is always a popular visitor to these shores. In an attempt to improve his result Jones had a change of diet, which meant dispensing with the familiar English cuisine of battered fish and beer. Apparently this was a successful move as under the new diet, his results improved. Personally I am yet to see similar improvements for myself, having become a semi-regular bike rider (around 30 km's a week). However, as I tend to try and keep my games as short as possible, (either through finding some trick, or taking a draw), my improved stamina probably has yet to find the right moment to shine. The article, titled "Grandmasters of bodies as well as minds" can be found here, at the ABC website. After 7 hard fought rounds, Adrian De Noskowski is the 2015 ACT Champion, after beating Jeremy Reading in the final round of the tournament. Reading went into the final round on 5.5/6, after drawing with Alana Chibnall in the morning round, while De Noskowski had beaten Victor Braguine to reach 5/6. The Reading v De Noskowski game started with an early draw offer from Reading, but De Noskowski declined it, knowing that only a win would deliver him the championship. At one stage Reading was a pawn to the good, but De Noskowski kept looking for counterplay. Reading tried to shut down De Noskowski's play with a temporary piece sacrifice, but this rebounded when De Noskowski set up a mating net. The win allowed De Noskowski to claim the title by half a point, and relegate Reading to second place. Alana Chibnall finished in outright third after drawing both her day 4 games. She was worse for quite a while against Dillon Hathiramani but a fairly generous draw offer allowed he to finish on 5/7. Bill Egan had a good tournament, drawing with Harry Press in the final round and picking up a share of the Under 1700 prize. Along side him were Thomas Johnston and Joshua Lee, all on 4.5. Indis Danaswara was the best Under 1100 on 4/7 (including a win over De Noskowski in round 1), while Benjamin Woo was the Best Under 800 on the same score. Final standings plus all the games from the tournament can be found here. With 2 rounds the play, Jeremy Reading leads the 2015 ACT Championship with 5/5. He started that day with a win over joint leader Harry Press, before beating CM Bill Egan in the afternoon round. A point behind Reading are Alana Chibnall and Adrian De Noskowski. Chibnall players Reading in round 6, while De Noskowski is up against Victor Barguine. The Reading Press pairing resulted in an exciting game, with Press on the defensive for a lot of the game. However he held Reading at bay, and at one stage reached a nearly winning position. However he missed a strong knight fork, and allowed Reading to reach a win rook and pawn ending. The loss for Press had a knock on effect, as he then blundered his queen on move 8 against Adrian De Noskowski in the 5th round to end the day on 3/5. Chibnall had two reasonably quick wins, beating Tim Pearce and Brian Butler. Curiously Butler resigned after he decided the move he played was a blunder, thinking Chibnall was winning his queen. Turns out that he could have block that threat, but the move that Chibnall was going to play was in fact winning. Going onto the final day Reading is the clear favourite to capture the title, but a loss the Chibnall would throw the tournament wide open. Even a draw would create chances for the chancing pack. Jeremy Reading and Harry Press share the lead in the ACT Championships, with 3/3 after today's 2 rounds. Reading had a very tough second round against Thomas Johnston, with the game reaching R+B v R after 70 moves. While the ending is usually drawn in theory, it is hard to defend in practice, and this is how it turned out. Reading had a more direct victory in the third round, beating James Satrapa with an attack on his king. Press defeated Indis Danaswara in round 2, before beating Brian Butler in a hard fought third round game. Press and Reading will meet in tomorrow mornings round, with the winner well placed for overall victory. A couple of other tournament favourites had a tough time in today's round. Tim Pearce beat Victor Braguine in round 2, but was in turn upset by Bill Egan in the third round. Despite losing to Press in the 2nd round, Danaswara bounced back to beat Thomas Johnston in the third round, while Saffron Archer scored a good win over Albert Winkelman. Full tournament results can be found here (chess-results.com). You can also play through the games from the event by clicking the games link. The 2015 ACT Chess Championship began tonight, and the first round saw a number of upsets. While the tournament is missing the absolute top tier of ACT chess, there field was still quite strong by Canberra standards. But once the first round started it seemed the form guide went out the window. The first higher rated player to fall was Matt Radisich who lasted 13 moves against unrated Neetash Mathur. 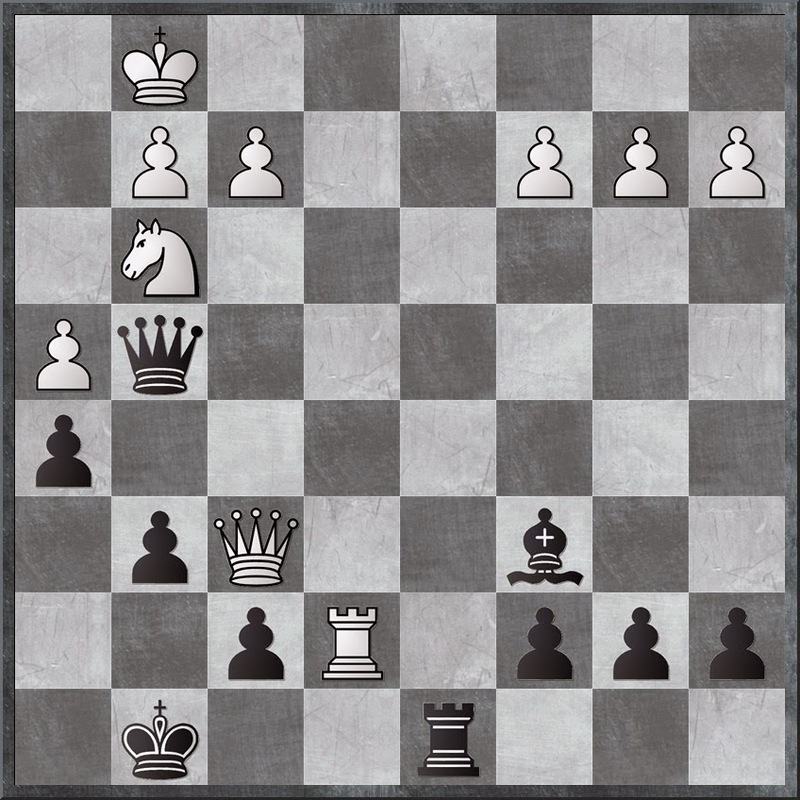 Even more surprising, was Adrian De Noskowski getting mated in 16 moves against Indis Danaswara. Looking up from my arbiters desk I saw them resetting the board and simply assumed it was a routine top half v bottom half win. It was only when I entered the game that I discovered otherwise. After that some semblance of order was restored, with the higher rated players picking up points. Then in the junior clash between Dillon Hathiramani and Albert Winkelman, a single miscalculation by Hathiramani in a winning position cost him a whole rook, and the game. And in the final ame to finish, Ziqi Yuan drew with Alana Chibnall, after holding an advantage for a lot of the game. With so many upsets it is already possible to say that this years event is a wide open one. With no clear cut rating favourite, the title is likely to go to the player who can keep their head when all around are losing theirs. In the early days of computer chess, the "horizon effect" was an ever present danger to programs. Essentially, the horizon effect was when a program was faced with an unstoppable threat it would sometimes play a move that pushed the threat to beyond the depth of its search, making it disappear. 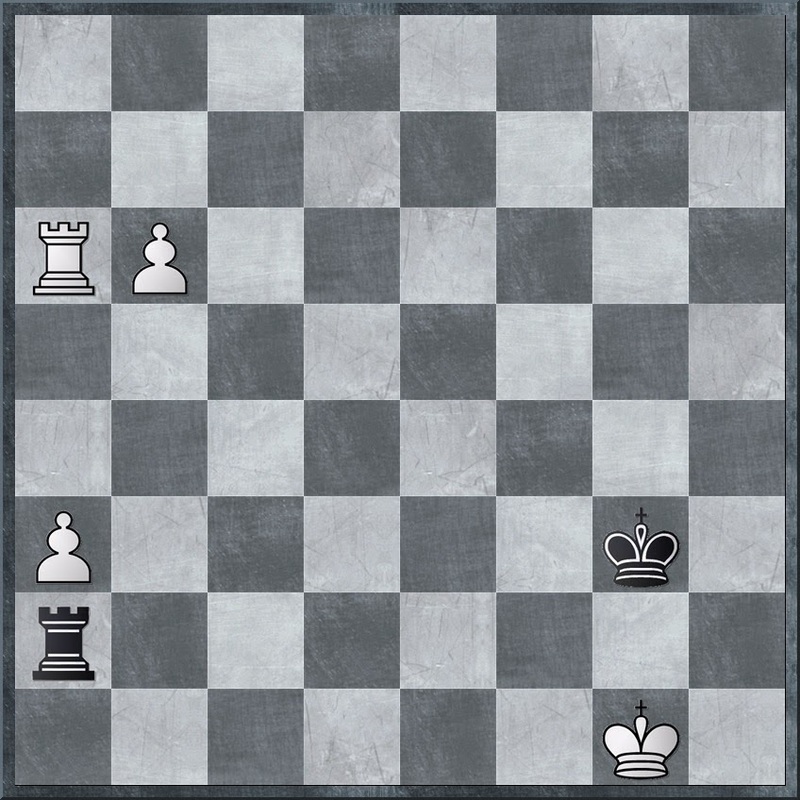 The problem with this is that the threat would still exist, popping up after the next move, and the move that delayed the threat might be a bad one anyway ( eg White is going to lose a queen by force in 5 moves, so the program sacrifices a pawn to delay it by one move, and beyond its search depth). Eventually the problem was "solved" by both the increase in search depth, as well as improvements in search techniques (ie capture extensions). However it still happens these days, but often in another way. There are a number of positions where even strong engines get the evaluation wrong due to not being able to see far enough. It isn't that the engine is pushing the threat further down the road with bad moves, just that the winning idea takes quite a number of moves to execute. For humans, spotting the key idea can be quite simple, and our more abstract thought processes then allow us to recognise the eventual outcome well before a computer does. In fact an example of this occurred last night at the ANU Chess Club. Mark Hummel (someone who has written his own chess engine btw) decided to be a little adventurous and sacrifice his queen in return for a charging passed pawn. Eventually the pawn was halted at d2, and the material balance crystallised as R+B v Q. The problem for White was that the pawn was blockaded by the queen, and any move away just allowed Black to queen. Feeding this into the computer, the engine kept returning 0.00 as the evaluation for quite a while. It was only when the program spotted the idea of protecting the pawn with the bishop (freeing up the rook) did it finally realise that Black was simply winning, something that Hummel spotted a number of moves earlier. Week 4 of the 2015 ANU Masters saw 3 drawn games, and one significant victory. Miles Patterson chanced his arm with a kingside attack against Victor Braguine, and was rewarded with the full point. Patterson allowed Braguine to capture a few stray pawns on the queenside, while improving the attacking placement of his own pieces. Braguine tries to defend by swapping off a centrally placed knight but this allowed Patterson's queen to enter the game with devastating results. Both the Bliznyuk - Litchfield and Chibnall - De Noskowski games were fairly solid draws where the point was split when an equal endgame was reached. The Press - Reading game was also drawn, but in a somewhat more dramatic fashion. Reading had a clear advantage in the middlegame, with a rook and extra pawns for two knights. Press tried to whip up an attack but ended up dropping a piece to end up an exchange down. However he did end up with a protected passer as compensation and suddenly Readings rooks were getting in each others way. Even the exchange of a pair of rooks did not help reading, but just when he was looking lost, he found a line which was good enough to draw. He eventually gave up the rook for a pawn, but was able to remove the remaining pawns to leave K+N v K.
Despite his loss, Braguine still leads the tournament on 3/4. Patterson, Chibnall and Litchfield are half a point behind, while Bliznyuk is the only other player on 50% or above. The Vice website has a regular feature "The Hidden Language" which looks at the specialist words and phrases used by people taking part in a particular activity. Recently they looked at the hidden language of chess, interviewing well known chess coach Bruce Pandolofini. Reading the article brought back memories of my chess playing youth, when such phrases peppered my own speech. While I am more polite these days, patzer, shmuck and putz were all good yiddish words that I used on occasion. (Note, if you want some slight NSFW fun, look up the meaning for putz). And at times it seemed that there was a competition to see who could use the most obscure slang, including sentences like "I had a queen side pawn majority, but with a strong outpost on f5, I was able to find a pawn break on the e file, double my rooks, and crack him with my g pawn. Shafted by the plastic man!" I'm not sure what language young chess players speak these days (is it all about centi-pawns?) but I really do think that the education of the well rounded chess player should always include a course in chess terms and idioms. The 2015 ACT Championship is being held over the Canberra Day long weekend, from the 6th to the 9th of March. The tournament will be a 7 round FIDE rated swiss played with a time limit of G90m+30s per move. The schedule is 1 round on Friday 6th at 7:30pm, then 2 rounds a day, at 10:30am and 2:30pm. The tournament is being held at Campbell High School, Trealor Crescent, Campbell (next to the War Memorial). Entries will be taken before the first round at the venue, from 6:30pm. The entry fee is $65 ($45 for concession) and membership of the ACTCA is required. This year sees the event trialling a 7 round single (long) weekend format. For the last few years the event has run over 2 weekends, but scheduling difficulties, as well as a preference for a shorter event from some players, has led to a look at the shorter format. At this stage the entries are around the 20 player mark, but this is expected to grow over the next few days. Conventional wisdom is that quick Correspondence Chess (CC) wins are a thing of the past ("it's all computers innit"). However not everyone uses computers to play CC, and unlike OTB chess, other kinds of accidents are possible. I have had games end abruptly due to misentered moves (an opponent once left a queen en-pris) and there was the famous "conditional" game which went 1.e4 b6 plus the reply "On any white move 2. ... Bb7". White sent 2.Ba6 Bb7 3.Bxb7 by the next post. Looking back through my own CC games the shortest proper win I've had (as opposed to opponents just not moving early in the game) has been 9 moves. And even then, the first 4 moves were supplied by the organisers, as it was a Traxler Thematic with the game starting on White's 5th move. Fans of the Traxler may find it slightly underwhelming, as I was following theory up until move 8, when my opponents TN on move 9 simply allowed a mate in 1. I'm not sure what the record for the worlds largest chess set is (real life elephants maybe) but a set made by Toyota would go close. It consisted of various models of Toyota Cars, and board was a floor of a stadium in Japan. If you look at the video contained in the new story here, you will of course notice that are not actually playing chess, but Shogi (Japanese Chess). However I am still going to include it under the "chess" heading, as the games are quite similar, and more importantly, one of the players was Habu Yoshiharu. I have covered him in previous posts, but he is both a FIDE Master in chess, as well as being one of the strongest Shogi players in history. And for those that are familiar with the rules of Shogi, I'm pretty sure that did not play the game exactly according to the rules, as it would have been difficult to turn the pieces over to signify a promotion being made!